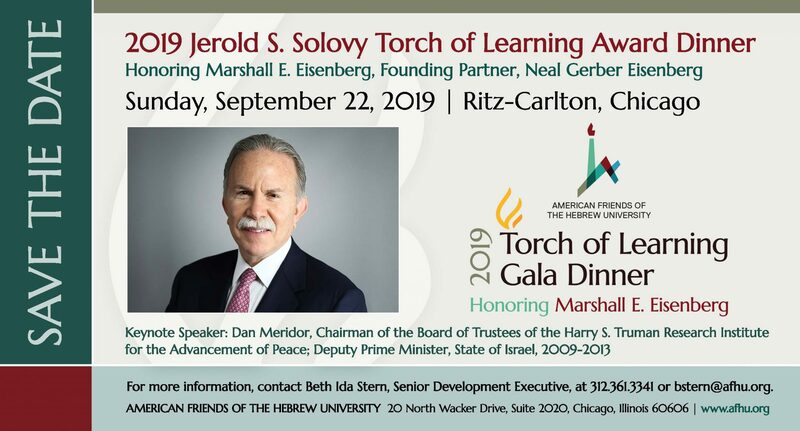 The 2019 Jerold S. Solovy Torch of Learning Awardee is Marshall E. Eisnberg. Mr. Eisenberg is a founding partner of Neal Gerber & Eisenberg and strategic advisor for diverse clients with substantial business and personal interests worldwide. He manages a broad range of complex transactions and strategies for corporate and individual clients, including mergers and acquisitions, estate planning, federal, state, and international tax controversies, and venture capital transactions. Marshall is also highly regarded for his business acumen. He serves as a member of the board of directors for Sally Beauty Holdings (NYSE) and many private companies. He frequently serves as trustee for many families. In addition to his Torch of Learning Award, Marshall has been named one of The Best Lawyers in America by his peers for 29 years. Marshall has been a speaker at the University of Chicago Tax Conference and received the American Jewish Committee’s Judge Learned Hand Award, recognizing his outstanding leadership in the legal profession and the community.